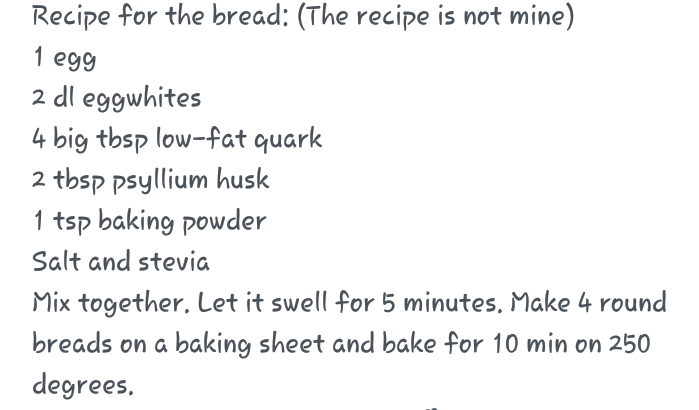 I promised to post the ingredients of the microwave bread i make. I dont weigh the ingredients and its a different amount each time. I have to tell you that the microwave bread is NOT a substitue for normal bread if that is on your meal plan. This bread is NOT the same as store bought bread and yes - the energy content is not that high. Hence why i usually always top my bread with eggs/chicken and cottage cheese/butter etc to make sure that im getting enough energy. & oatmeal flour if i want it. I mix that all together - and it sort of swells up. And because of the psyllium husk it stays together and it becomes almost a little foamy - if its too clumpy i add more milk or water. And then i take a bit form it into a flat bread and into the microwave for around 3 minutes on 600 watt. And i can usually make 10 pieces of bread in one 'set'.